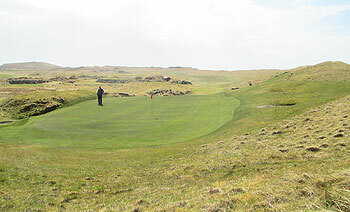 The Murvagh peninsula jutting out into Donegal Bay is the home of Donegal Golf Club. It’s an enchanting and isolated setting for a big links course. The panoramic view across the bay is sensational, with the Bluestack Mountains providing a dramatic backdrop. The prolific architect, Eddie Hackett, laid out the course in 1973 and Murvagh is considered to be one of his finest creations. Hackett was given a naturally rugged and crumpled piece of links land to play with and he used it well to produce a monster championship-length layout. Thanks to Pat Ruddy, Donegal now measures a mighty 7,200 yards from the back tees and we recommend that they be left well alone for the pros or for the very low single figure handicappers. Donegal’s layout is configured in two elongated loops of nine holes. The front nine runs anticlockwise and the back nine runs clockwise, sitting inside the outward nine. The first four holes are fairly ordinary, feeling inland in character, and then at the 185-yard par three 5th, we enter dune country. This one shot hole, called “Valley of Tears”, is a brute. A semi-blind tee shot to a narrow plateau green, we must make sure that we select the right club to traverse the valley and the bunkers in front of and below the raised green. The next three holes are stunning where the fairways rollercoaster up and down, flanked by huge shaggy sand dunes. At the turn, we are faced with a thrilling back nine, including the 12th, a monster par five, and the sadistic par three 16th, measuring nigh on 250 yards from the back tees. There is no doubt that Donegal at Murvagh is a very challenging links course and it should be up at the top of the must-play list for any serious golfer. "Hole 1… a totally new green running across the inward shot rather than with it. This to lay a premium on the club chosen coming in (good to do at a par-5)... and then I sculpted a front bunker into a dip at mid-point with pin levels left and right sweeping down into it. Hole 2… new fairway bunkers at left pinch the tee-shot a little and bring the natural out-of-bounds on the right into play for those seeking to get closer to the green. The green itself is totally new… raised by 2-feet or so at the front and 5-feet or so at the back thus allowing for deep bunkering front and sides. The green is angled right to left to reward those who take-on the boundary off the tee. Hole 4… totally new tees, fairway with bunkers and a new green running left to right with bunkering at front right. All arranged to give strong golf images off the tee, the old set up was a wee bit blind, and it is a vastly improved hole. Hole 5… new tees to add length and offer differing angles on a classical par-3 to a shelf green. Hole 9… a totally new green (the first job I did there) and fairway bunkering. The green was moved back and to the right to tease the tee-shot and allow bunkering to impinge on the approach. Hole 10… new championship tees. Hole 12… a new green with stronger bunkering; newly conformed fairway with strong bunkering for the tee-shot; and the approach to the green rumpled and bunkered. Hole 13… another brand new green slightly raised to provide for run-off chip areas and for deeper bunkers. Hole 14… bunkering for the tee shot and fairway elevation changes to slow the drive, a lovely (if I say so myself) meandering stream brought into play in horse-shoe shape in front of the green (inviting golfers to gamble into the horseshoe if they really think that one club less for the third is all-important at this par-5 and a totally new green raised, tiered and bunkered. Hole 16… bunkered the green at this par-3. Hole 18… cut a V-valley through the hill to remove blindness off the tee; shaped and bunkered the fairway; and provided a lovely gallery green with very nice bunkering just under the clubhouse windows. That makes 11 holes heavily revised, refurbished and modernised. It is a remarkably different and better links than before but the analysts seem slow to realise what has happened as the club is not of the boastful type and hasn't broadcast the good news as others might. It was already one of Ireland’s finest but now I feel it is into a brave new place and I fancy that Eddie Hackett would be pleased enough with his co-designer!" At Donegal, the 17th has been modified and revisions made to the par three 16th, which was a very difficult hole for club players with a minimum measurement of 203 metres. The championship tee remains intact but new member tees have been constructed forward and to the right (to give a lovely new angle) at 160, 165 and 170 metres, with a new greenside bunker on the left balancing the removal of force with a little intrigue and skill. Played Murvagh in a 3-club wind and, from the 12th to the 14th, a violent squall off the Atlantic. Under those conditions some of the longer holes are very long indeed, even off the 6500-yard green tees that were the only ones in play on the day. However, I was fortunate to play with a member who was kind enough to tell me where the trouble was. Highly useful, because some of it is far from obvious. This is just a rock-solid, high-quality traditional links that will test pretty much every aspect of your game. Very fair and playable, with some big fairways to drive into, but often penal if you go off line and calling for plenty of improvisation when running the ball into the greens. Absolutely loved the stretch from 6 through 12, but the whole experience was to be recommended. Wish I could play here every week. Donegal is a big course in a great location, bring your A game ! We played mid Sunday afternoon in intermittent sunshine and a 2-4 club wind. The first is a gentle opener along the driving range, after that the course bares its teeth and never really relents until the well appointed 19th. As with every other course we've played in Donegal this is long. Since the course was busy by Donegal standards (read populated, on a fine ish Sunday afternoon we had to wait on about 7 shots) we elected to play off the 6600 yds or so Orange tees and it was very hard for 10/12 handicap players. However, it was never less than fun with absolute stand outs like the par 5 8th with its steepling roller coaster fairway amongst the biggest and best we've played, up there with the likes of Royal Aberdeen, Machrie and Perranporth. If you don't have a handicap from these parts forget your gross, if you get 30 points congratulations ! In my view the best pure golf experience in the area which is praise as the Rosapenna and Ballyliffen resorts are nearby. The course hits you square in the face at the 2nd and 4th where 2 shots with big clubs are needed. The 5th is an attractive par 3 and the 6th the first hole where par is a reasonable expectation. 7th is a brute but stunning. 8th is my favourite hole from an aesthetic perspective. The stretch 10, 11 & 12 are the best consecutive holes on the course with excellent variety. 16 is brutal and 18 is a strong finish. In summary, a big golf course which although brutal is an absolute joy. There are some courses (and, if you’re lucky, some clubs) where you just feel comfortable with from the moment you park up in front of the clubhouse. For me, Donegal is just that sort of place. Three years almost to the day, I teed it up here yesterday on a cold and blustery morning day that threatened to deteriorate but which managed to stay on the dry side of tolerable. The wind was blowing from the non-prevailing east, which made the par three 5th an absolute brute of a hole - and what about that devil of a bunker in the hidden dip in front of the green that I’d forgotten about? I’m not a fan of the grassy mound that fronts the 9th green or the non-indigenous vegetation behind the 10th green but those are minor agronomy quibbles in the wide scheme of things at Murvagh. The fiendish bunker to the front left of the green on the wonderful par five 6th and the big dipper fairway on the par five 8th are memorable features on the front nine whilst the wee burn on the back nine (that also crosses a couple of fairways on the inward half) is obviously designed to give grief to the unwary golfer at the par fives on the 12th and 14th. There was a temporary green on 17 as the hole is being lengthened by moving the greensite back (who said Donegal was too long?) so the club is obviously still tweaking the odd hole here and there to keep pace with the modern game. Then again, I suppose you don’t hope to retain your status as a Top 100 course in GB&I by resting on your laurels and not striving to improve what you already have – there are some courses you never tire of revisiting and Donegal’s one of them for me. Me and my playing partner both walked off the 18th green at Donegal feeling happy but also that we could have achieved so much more (I guess this is why we all come back to this game, time and time again...) This is a feeling we never had at Enniscrone, Rosses Point or Ballyliffin where we posted similar scores, but where the wind and course layout conspired to (almost) blow us to pieces. This quality, to present you with a challenge, lure you into taking risks and, occasionally, reward you for doing so, is something I really appreciate in golf course design and which will make me put Murvagh highest on my list when coming back to this corner of the world. Our group from Iowa played here in mid-August with a match with some of the members. Very friendly membership and beautifully designed golf course. Very underrated in my opinion and would definitely play again. Looking back at my review from six years ago when I last played here, I missed a couple of important factors: firstly, the fairways are generally wide and forgiving so golfers can afford to spray the ball around a little bit without being too harshly punished and secondly, the 18 holes occupy a generous 240-acre site so, in many regards, the long length of most of the fairways – and the fact that there are five par fives – merely reflects the scale of the property. I’m a big fan of “Bogey Hill,” the 18th hole – even if the raised green and shaggy mounding at the back are a tad on the contrived side! At the most northerly point on the course, a bank of old vegetation on the dune ridge next to the elevated 6th tee box has been removed and this now affords fantastic views across the sand flats and oyster farms out on Donegal Bay – I’d recommend that you stop for a wee breather at this point to soak up the scenery, especially if you’re still dabbing your eyes after posting a poor score at the preceding hole! Murvagh’s great value for money (as are ALL the courses in this corner of the Emerald Isle) and well worth adding to your "must play" list. Excellent course with alot of great challenges for all golfers,well worth a trip!! Played this course in fine weather during June 2011. We were all members of Scottish links courses and the consensus was that Murvagh was right up there with the best. A true links does not ( and often not ) have to mean heavy dune systems and some of the most difficult tests of links golf seem to be on the undulating and subtle holes. Suffice to say that everyone, from low to high handicap, thought the same - a belter. Course condition, clubhouse and staff were excellent and at a very fair price. To be recommended and repeated.